The Long Sleeve Shaping Crew-Neck Top offers skin-enhancing copper fabric combined with CASS Invisupport slimming and shaping to make you look and feel your best all day and in every season! 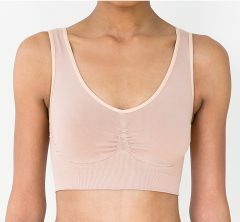 Skin-enhancing copper fabric combined with CASS Invisupport slimming and shaping make you look and feel your best all day and in every season! Enhance your silhouette from neck to hip in comfort with CASS. Our exclusively engineered seamless fabrics shape and slim you to the perfect hourglass figure without feeling constricted and confined. Eliminate back bulges and muffin top instantly by stepping into a CASS top or bottoms. Cool and comfortable shaping to be worn every day and in every season. “I wear this top everyday and have noticed a significant difference in the tone and texture of my skin. My age spots have decreased and skin looks much less loose around the mid section. I’ve always worn CASS shapewear tops and bottoms during the day, but now with the copper enhanced fabric wear repair, I cannot get enough and wear these to bed too. In the morning my skin looks better and better. I have also noticed that the result do not go away when I do skip a day of wear. Best product on the market! Audrey P.